The Post Room Project was an exhibition of artworks by Emily Robyn Archer, Artist in Residence with WHAT during 2010. The exhibition was launched on the 21 October by Denis Roche, curator of the Open Window project. WHAT has been running an artist in residence programme since 1994. Visual artists are given a studio space for a period of six months during which time they create a new body of work for exhibition in the hospital. During her residency, Emily found an ingenious way of infiltrating the hospital through the post room. 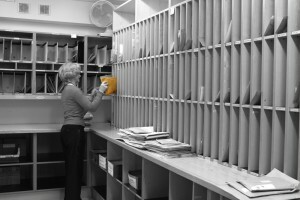 The post room is a hub in the hospital through which all hard copy communication travels. In a blind leap of faith, Emily chose this as the point from which to send creative invitations to hospital staff members. It was not unlike sending a message in a bottle. The responses to this project were made into animations that have been installed in a series of small wall mounted post boxes. The viewer must push the flap and look inside.